Wolf cheer soars higher and higher!! Week by week, competition by competition, practice by practice, there is one goal. Improvement, as individuals and as a team. 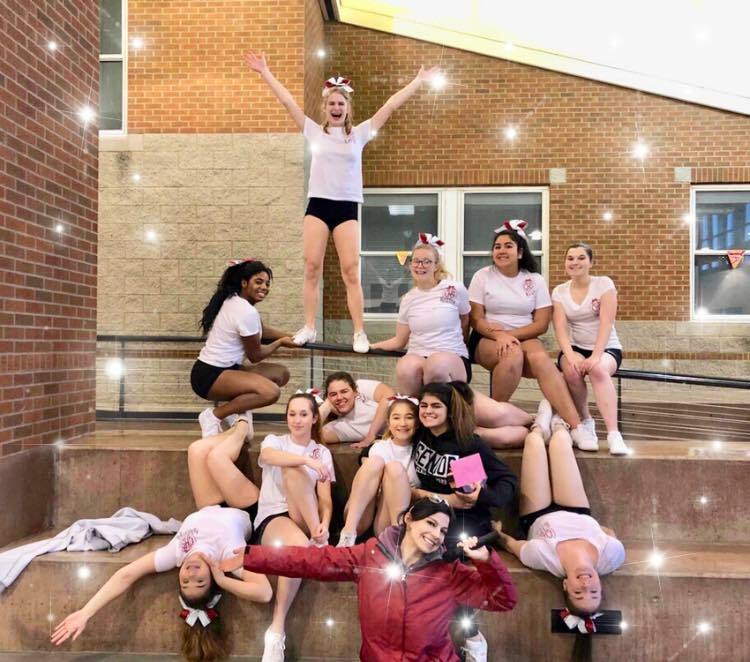 While Coupeville High School cheer coach BreAnna Boon would love to add some championship plaques to the school’s Wall of Fame, her focus remains crystal clear. And her cheerleaders are listening, and responding. After not fielding a competitive cheer squad since 2011, the Wolves are back, and are coming for all the trophies. Saturday, competing in the Small Game Day division at an event in Auburn, Coupeville claimed 3rd place, but actually bettered its score from its first competition, where it placed 2nd. And, not only did the Wolves raise their score, but they did so by a staggering amount – 12 points. “That’s almost unheard of in the cheer world,” Boon said. “Week to week usually teams vary their score three to five points. The Wolves, who are pulling double duty during winter, working as a sideline team for basketball while also training and competing, face down all comers at their events. Any school, from 4A down to 1B, can send a squad onto the mat in their class during the regular season, as long as they have 12 or less cheerleaders competing. If CHS makes it to state, which requires earning 65 points at a regular-season event, it will face off only with fellow 1A schools at the championships. Through the first two events, the competition roster has included Jaden Marrs, Bella Velasco, Kim Castro, Melia Welling, Marenna Rebischke-Smith, Coral Caveness, Ashleigh Battaglia, Mica Shipley, Ja’Tarya Hoskins, and Emily Fiedler. Senior Julie Bucio will sub in for Welling next Saturday, Dec. 15, when the Wolves compete at the “Battle at the Border” in Vancouver. While Boon appreciates the hard work her athletes give her, they return the feeling. As the Wolves continue to collect awards, the focus never changes. “When I first talked about going to competition with the team, we were never out to compete against anyone else; we were only out to hit that 65-point goal, because that will qualify us for state,” Boon said. “You wouldn’t wouldn’t believe the hard work these girls put in at practice,” she added. “The routine basically changes every week based on the critiques from the judges.